The post HOW TO MAKE LAVENDER OIL appeared first on Black Thumb Gardener. Lavender is one of my top aromatic plants to use in my gardens so there is an abundance of it around every year. After years of procrastinating I’ve finally set out to make my lavender oil. At the outset I didn’t think it would be that hard and luckily it seemed to be a fairly easy process. Having some lavender oil around during the winter seemed like a great idea. Every time I mow I always grab a few sprigs of lavender and crush / rub them in my hands and take a huge waft of the scent. Besides just the aromatic properties lavender oil has been used for centuries as moisturizer. I wonder if this will cut down on Cara’s massive lotion allowance, probably not. So it my research in to the processes of making lavender oil I found several techniques. I’m going to run through all the techniques and then talk about my experience making the lavender oil. Side note: These techniques will make lavender oil and not lavender essential oil, it’s important that is clear to you. It’s very important that your lavender is completely dried out before you begin to infuse any oil. If you fail to properly dry out the lavender sprigs then it becomes likely that your lavender oil will become rancid. Luckily drying lavender is a very straightforward and easy process. Cut your lavender off with hand pruners or scissors. Make sure to cut off at least 6 inches from the lavender. Use some a rubber band to tie the lavender together at the base of your cuttings. We will use a rubber band over twine because as the lavender dries it will shrink slightly in size and we don’t want it to fall apart. You may see some pieces fall to the ground despite the rubber band, you can either take enough cuttings that this doesn’t matter so much or you can re-attach any fallen sprigs. Hang the lavender cuttings upside down in dry warm spot that will see direct sunlight as you let it sit there for the next 12 to 14 days. That’s all it takes to dry out your lavender and now we can begin to infuse our oil with the lavender. It was a surprise to me to learn that the purple flowers don’t hold all the scent of the lavender. In fact if you like you can separate the flowers from the stems by using tube of rolled up newspaper and roll them on a table (back and forth). The purple flowers can be used on their own for eye masks or drawer sachet. Clean out your jar and completely dry it, then place your dried lavender into the jar. Pour your oil over the lavender until it is covered completely. Place your jar in a window sill that will see a good amount of sun, it will sit there for the next 3-6 weeks. The sun over the next month or so is what will release the parts of the lavender plant that will infuse the oil. Once you’ve decided the oil has sat there long enough pour it through your cheese cloth into your last bottle. Certain instructions I found called for lightly crushing the lavender with flowers still intact and then putting them in to your first jar. I also discovered instructions that suggested shaking the jar on a daily basis. The slight crushing makes sense, but the daily shaking of your lavender oil seems like an unnecessary step that I did not follow. Just like the other technique you start out with dried lavender cuttings but this time you fill you crock pot with 1 half cup of lavender to 1 whole cup of oil. Set your crock-pot on low and let it steep for the next three hours. Let the oil cool and strain it through cheese cloth. This technique sure seems a lot quicker but I think I like the old school method I mentioned first. I would probably go with the crock-pot method for lavender oil if I was trying to make a large batch of it all at once. I stuck with olive oil since we always seem to have an abundance of it but there where some other suggestions that I found through me research. As long as you stick with a natural oil that doesn’t have an overpowering scent of its own you will probably be safe. I even saw a recommendation for witch hazel oil, the main benefit was that if you were going to use the lavender oil as a lotion the witch hazel would act as a natural skin toner. Simple answer, anywhere you want. Pick out a bottle that you like and store away, lavender oil should last you a life time in any bottle. Stopping by a second-hand store or antique store to find vintage perfume bottle would be very classy, but I’m probably just going to keep mine in a Ball mason jar. The post HOW TO GROW SUNFLOWERS appeared first on Black Thumb Gardener. The hardest thing about knowing how to grow sunflowers (Helianthus annuus) is deciding which ones to grow. Nearly fail-proof, they’re a great project for kids and new gardeners. Besides the classic golden yellow flowers, colors range from deep burgundy, russet and chocolate to lemony yellow, blazing bicolors and pale vanilla. There’s a sunflower for every garden, whether 15-foot giants or tiny dwarfs for balcony pots. Sunflowers grow a long central taproot that doesn’t like to be disturbed. Rather than starting seeds indoors, sow directly to your garden. Sunflowers grow bigger and stronger in return. Any soil type is fine, as long as it has good drainage. Pick a site that gets at least six to eight hours of direct daily sun — the more, the better. For best results, cover the area with 3 to 4 inches of compost, and work it into the soil to create a loose, fertile home for roots. For smaller varieties, no fertilizer is needed. Bigger varieties benefit from a boost. Apply a balanced, slow-release fertilizer — one with all three numbers the same. Work it into the top few inches of your sunflower bed to provide season-long nutrition. Sunflower seedlings resist some cold, but for most areas, wait until at least two weeks before your last expected spring frost before you sow. As you plan, think how tall your sunflowers may grow and where their shadows will fall. Plant the tallest varieties to the north side of shorter plants, so everyone ends up with sun. For rows, make a shallow trench and plant seeds 1 to 2 inches deep and 6 inches apart. Cover the seeds with soil, and keep them well watered. You’ll see sprouts in seven to 10 days. For continuous blooms, sow a row every two to three weeks; you’ll have cheery blooms until frost. Most sunflowers mature in 80 to 120 days. Sunflowers don’t like competition from weeds — or other sunflowers. Apply 2 to 3 inches of mulch to keep weeds down. Once seedlings begin to grow, thin them to 2 feet apart for large varieties and 1 to 1 1/2 feet apart for dwarf and medium types. The more room they have, the larger and stronger they’ll grow. If growing smaller varieties for cutting or in pots, crowding is okay. Space seeds 2 to 6 inches apart for thinner stems and smaller, but beautiful, flowers. Sunflowers tolerate drought once established, but moisture is critical between three weeks before and three weeks after flowering starts. Water plants deeply and thoroughly. Then let soil dry before watering again. This helps roots grow deep and strong. If growing multi-head types or giants, heads can get heavy. Stake large sunflowers, so heads don’t snap in winds or heavy rains. If you want seeds, think ahead and protect seed heads from birds. Cover them with mesh bags or other protective netting. Seeds are ready once the back of the flower head turns from green to yellow and the tiny petals dry to expose brown seeds. Usually the head begins to droop, too. Cut the head off and hang it upside down in a cool spot with good air circulation, and let it dry fully. Then collect your seeds. Sunflowers are packed with protein, iron, potassium and vitamins B and E. Toast the seeds in a dry skillet over medium heat for 10 to 15 minutes, or oven toast them on a cookie sheet or shallow pan for about 10 minutes at 350 degrees Fahrenheit. For rich, slow-roasted flavor, soak the seeds in strong salt water overnight and roast them at 200 degrees for 2 1/2 to 3 hours until crisp. Enjoy! WHAT DID YOU THINK ABOUT OUR “HOW TO GROW SUNFLOWERS” ARTICLE? The post GROWING CALLA LILIES OUTDOORS appeared first on Black Thumb Gardener. People love Calla Lilies and I understand their shape and colors make them a beautiful choice for summer color. Calla Lilies aren’t overly complicated but in order to grow them in colder climates like here in New York they will require a little love and attention. In the spring when the danger of the last frost has passed find find a place of full to partial shade to grow you callas. Out West and down South you will want to choose areas with partial light so that the calla lilies don’t dry out as quickly. Calla lilies need nutrient rich and most soils, so the first step will be to till the soil and amend it with organic mulch or mushroom compost. If the area in your garden where you intend to plant the calla is overly sandy or rocky you will want to make sure to add more organic material. Calla lily tubers should be place 3 to 4 inches down in the ground and 12 inches apart. When you place the tubers in the ground be sure to place them in horizontally, with the growth points facing up. You can start Calla Lily tubers indoors several weeks before the last frost. In 12 inch pots you can place 12 tubers and once the last frost has passed you can simply dig the pots into the garden and let them grow all year. Calla Lilies are a tropical plants and are used to moist soils, in order to keep yours happy you will need to make sure that the soil around your calla lilies doesn’t dry out. To make sure that the callas have all the nutrients they need watering them with with a water-soluble general plant fertilizer (like this one). When the flowers begin to form you may want to increase the amount of fertilizer you apply, this is the time when the plants are most in need of nutrients. After the flowers have passed you will want to stop fertilizing the plant so that the tubers will enter a dormancy period. Depending on your U.S. Hardiness Zone you may be able to overwinter them outdoors. Calla Lily tubers are hardy up to zone 9, but zone 8 can keep them outdoors if they are covered in a layer of mulch throughout the winter. I’ve even heard of them being overwintered in zone 7 given enough mulch. Here in New York I pull the bulbs before the first frost every fall. After you dig up the bulbs prune back the growth to within a half inch from the tuber and place them in sand or a dry peat moss. During the winter try and store them in an area that will stay between 60 and 75 degrees. If you are growing your Calla Lilies in containers all year long you can simply unearth the pots and bring them indoors for storage. Make sure to keep the pots completely dry during the winter until you are ready to start growing them again in the spring. The post COMPOSTING | A GARDENER WITHOUT COMPOST IS NO GARDENER AT ALL appeared first on Black Thumb Gardener. BENEFITS OF COMPOSTINGIn 340 B.C. the great Greek historian Herodotus noted that the soils of Egypt were the foundation on which Egyptian civilization was built. Just like ancient Egypt’s civilization relied on the soils so do every gardeners success. Some how people have been able to forget the importance of soil cultivation at times, does The Dust Bowl sound familiar? For gardeners composting is one of the greatest ways they can tend to the quality of their soil. Composting can be an intimidating thing to take on for the beginning gardener and through this article I’m going to try to demystify some of the keys to beginning a compost bin. With a compost pile in your yard you will have a constant supply organic material ready to be added to your top soil. By mixing fresh compost into your soil you can amend the soil structure, bringing sandy and clay soils closer to the desired loam structure. Adding compost to your soil has the ability to regenerate poor conditions. Micro-organisms like bacteria and fungi help break down your compost into humus. Humus is a nutrient rich material that holds water well, both conditions important to gardens. Some studies have even show that compost can keep plant disease and pests at bay, this can cut your need for chemical fertilizers, and give gardeners bigger harvests. A benefit of composting is the reduced need to send spent materials to landfills, reducing the production of methane and leachate. Storm-water runoff is a huge problem and keeping a compost bin reduces the amount of containment’s that will be included in the storm-water runoff. Adding compost to embankments and parallel to creeks, lakes, and rivers can cut erosion. By building your own compost bin you reduce the use of landfills which will help reduce the need to build more landfills. Nutrient balance and Feed stock. A good balance between green organic material (grass, food scraps, and manure) and brown organic material (dry leaves, wood chips, branches). Green organic materials contain high amounts of nitrogen while brown organic material has high amounts of carbon. Getting a good balance between these two types of materials may take some experimentation on your part, but soon enough you’ll develop a feel for this. Material size. If you take the time to tear up, break, or shred the materials you add to the compost pil you will increase the surface area which will allow the microorganisms to feed on the material at a greater speed. By decreasing the size of the materials inside of your pile you also improve the insulation of the pile, making it easier to reach the optimal temperature (see below) for your compost pile. Moisture levels. A good supply of moisture is needed to help the microorganisms inside your compost. If you choose to compost inside of a closed bin with a roof you may need to water your compost pile occasionally. Oxygen flow. This is the step you will really want to think about before starting your compost pile. Aerating the pile is important, it allows for decomposition to take place at an increased rate. Over aerating the pile is also a concern though as that could dry it out and stop the composting process. You can use a pitchfork to turn your pile over, you could place pipes underneath your pile, or create a base layer with larger pieces of organic material like wood chips or shredded newspapers. Temperature. Those microorganisms that are so key to the composting process are pretty picky about the temperature they will work in. Keeping your compost pile in the right temperature range will help speed up composting and crush pathogens and weed seeds. The temperature inside of your compost pile can actually get as high as 140° F. If you don’t keep your pile at a good temperature rather than experience the benefits of composting your experience the downside of rotting. * Check with your local composting or recycling coordinator to see if these organics are accepted by your community curbside or drop-off composting program. There are several styles of composting some of them are more common to a gardener while some are generally used by farmers and municipalities. For the home gardener it will help to have a pitchfork, square-point shovel, and water hose on hand. This is the traditional compost pile that most people think of. An aerated static pile is just what is sounds like a pile of compost that doesn’t move and is turned over to aerate it. People put these in composting bins generally (maybe a post about building one of these would be good) you can build your own or buy one. I’m currently building a compost bin so I can take advantage of this style (pictures and article to come). With vermicomposting red worms are used inside of a bin with the organic materials to break down into our high value compost. By using red worms inside of the bin you can actually eliminate any smell that might originate from a compost pile (really important to my wife). You can build your own vermicomposting bin or buy one like the I’ve shown to the left. Disclaimer: the image to the left is an affiliate link and I’ll get a commission if you click on it and buy something, it’s a great way to support this blog if you enjoy reading it! With this method you will need to buy a container to compost in (like the one I’ve linked to). You’ll deposit your organic materials in the vessel and turn the barrel manually, normally a lever. These systems are nice because they cut any odors that may come from a compost pile so they can be kept closer to your home. Enviromental condiontions like the temperature, moisture and aeration are easily controlled withing this in-vessel composting system. This style of composting is pretty hard to do with out the space and machinery generally possessed by farmers. Your organic material is put into long rows of material called windrows and are occasionally turned using larger machinery. These composting piles are usually kept between 4 and 8 feet high with a width of 14 to 16. For the urban gardener and composter there is Naturemills Metro composter. This thing is pretty pricey but boy does it work. I don’t know what kind of black magic happens inside of this machine but it turns out fresh compost faster than any of the other methods above. If you’re interested in checking this out you can click on the image to the left. Now that I’ve knocked out this article on composting I can build on that and cover making your own potting soil! Do you have any compost experience you can send with us, or are you going to start your own? Tell us in the comments below. The post DIY AQUAPONICS | HOW TO BUILD A SYSTEM appeared first on Black Thumb Gardener. Building your own DIY aquaponics system can be an easy weekend project depending on the sizeyour want to create. There are companies out there that use old warehouses to enclose aquaponics systems but we’re not going to get into that because it certainly isn’t DIY. We are going to talk about using a fresh water system and anybody with a salt water fish tank can tell you how much more attention they take, and that’s not what we’re about here at the Black Thumb Gardener.DIY Aquaponics is a class of farming that builds a food production system by combining a system of raising aquatic animals like fish, crayfish, or prawn (aquaculture) with hydroponics which is growing plants in water. The advantages of aquaponics is the combination of aquaculture and hydroponics creates a symbiotic relationship. The aquatic life in your system builds nutrients in the water that the plants use to thrive and keep the level of nutrients from getting so high that become toxic to the aquatic life. Where are you going to find your aquaponics system? How much food and aquatic life do you want your aquaponics system to produce? Hopefully you’ve thought a bit about what you want from your system and where it will be located. Tank for aquatic life-like a fish tank up to a 55 gallon drum. Craigslist’s free section is your friend if you want to keep the cost down. A water pump to move the water from the aquatic tank into the grow bed. If the grow bed will be level with the water tank you will need to pumps to pump the water each way between tanks. Depending on the size pump pick up the right plumbing. Clear vinyl tubing is enough for smaller setups but if you’re in the 55 gallon drum arena you will probably want to use pvc piping which is plant and fish safe. A grow bed, this can be a plastic tote from Walmart of your can build your own very easily with a bit of scrap wood. Hydroponic substrate will be used by the plants to hold onto something so they don’t fall over. With your supplies in hand now we can begin to set it all up. I suggest doing this in the place that your aquaponics system will live its life because once you build it and add water it will be difficult and risky to move. Depending on what materials you have chosen to use you need to assemble them into a structure similar to this. Don’t worry about being exact there is a lot of range for success and little worry of messing this up. Just take your time assembling your components. What do you want to eat? Then that is exactly what you should try to grow. You may be suprised how easy it is to grow your favorite herbs. If you’re going to grow something that fruits like peppers or tomatoes you are going to make sure you have enough light, this may mean adding a grow light. I started by adding simple gold-fish and snails to the aquaculture part of my system and used duckweed and algae to build nutrients to feed the fish. That’s it, experiment and enjoy your aquaponics system. Make sure to let us know how your aquaponics system works out, and if you need any help I suggest looking at our forum! The post 17 PLANTS YOU GROW FROM KITCHEN SCRAPS appeared first on Black Thumb Gardener. I love composting all the kitchen scraps I can but when I fill up my compost bin or run low on some vegetables in the garden using kitchen scraps to grow plants is a great activity. I love using kitchen scraps to start new plants as a fun gardening activity with my son, everyday we check and see how the plants are progressing. It’s a great way to come full circle on produce we bout at the market together and cooked together. Starting your own plants from kitchen scraps is really easy and for a gardening nerd like me! If You are going to attempt this I suggest making sure the scraps you start with are good quality, I like to use organic produce grown locally when I start plants from kitchen scraps. You could go out and buy some vegetable specifically for growing but I like to wait till I actually have a call for them in my cooking. With all 5 of these examples you will use the end of the vegetable with the white roots. Take the left over white roots and place them in a container with a small amount of water in it. You want the roots to be wet but you don’t want the entire thing submerged. Take your container and place it in a sunny window sill. I’ve actually grown green onion scraps in a fairly shady window on the north side of our house, your success may vary. I like keeping some in a window in the kitchen for my morning eggs, and in my office for snacking on (the wife loves kissing me after that). Within 3-5 days you will begin to see new growth come up. Remove the produce as you need and just leave the roots in the water to continually harvest your kitchen scrap crops. You should refresh the water weekly to keep the plant healthy. After about a week there should be some new growth from your lemongrass. Once you have new growth you will need to transplant the plant from the water into a pot with soil and put it back into the sunny windowsill. You want to wait till your lemongrass reaches a foot tall before you begin harvesting it. Just like before cut off what you plan to use in the kitchen and allow the roots to continue to sprout. It’s just like cutting your lawn, it will just keep coming on if you keep it healthy.Lemongrass is similar to all other grasses and because of that you just need to place the roots you cut off into a container with water and put in a sunny window. In my experience the lemongrass is a little more dependent than green onions and leeks from above. Just like the scallions, you will take the white roots of these vegetables to grow your produce. By cutting of the stalks or leafs with an inch or more and placing them into a bowl of water with the roots facing down you will be on your way. You want to make sure the roots are in water but you don’t want to submerge the entire plant. Make sure to place the bowl into a sunny window and spritz it with water weekly to keep the top of the plant moist. Several days later you will begin to see the roots and leaves sprouting. 7 to 10 days in remove the plant from the water and plant it into soil with only the leaves above the soil. Your plant will continue to grow and in several weeks you will have a new head ready to be harvested. If you want a different way to go with your pant you can try planting directly into the soil, skipping the water staging step from before. Keeping the soil from drying out will be very important that first week. Soon enough you will begin to see new growth sprouting up out of the soil, and under thesoil roots will begin to sprawl out into the soil. After the plant acclimates to its new home you will be ready to harvest the next time you need Ginger. Pull the entire plant out of the soil and cut off a the pieces you need, and just replant it like you did initially.If you’re looking for an easy plant to grow indoors Ginger is the one for you. Just take you’re a chunk of Ginger from your kitchen scraps and place it into the soil. Make sure the newest buds are facing up. Unlike the other plants we’ve talked about so far Ginger will enjoy filtered light rather than direct sunlight. As an added bonus for you Ginger makes a great house-plant. Even if ginger isn’t your thing as far as cooking goes you can still get some aesthetic value out of the plant. Taking potatoes from produce back to growing is a great way to keep more waste out of the garbage. You can grow any variety of potato you like, it should just make sure the scrap has ‘eyes’ growing on it. With a potato that has a strong presence of eyes you can chop it up into 2 inch square pieces. Make sure each piece has 1 – 2 eyes. After you’ve cut your potato into pieces leave them out in room temperature for a couple of days. Leaving the pieces out allow the cut surface area to dry out and become callous which will prevent the pieces from rotting in the ground. Potatoes need a very nutrient-rich soil, so if you have compost you should be sure to incorporate some into your soil before you plant it. When you are planting your potato cubes make sure they are in the 8 inch depth range with the eyes facing the sky. When you back fill your cube place 4 inches over the potato cube and leave the other 4 inches empty. Over time as your potato grows and roots begin to appear you will want to add more soil. You only need a single clove to regrow an entire garlic plant, just place the end with the root down into the soil. Place your container in a warm part of your home with direct sunlight and sit back and wait for the garlic to root itself and begin to send up new shoots. After the garlic becomes established in the soil cut back the shoots and the plant will begin to put all its resources into growing a big delicious garlic bulb. Just like the ginger above once you harvest your produce you can repeat this process and run through the cycle again. With onions your going to use the root end you cut off when prepping to cook your onions. Onions are great because of the ease to propagate. You want to try to keep half an inch of onion above the roots. You will want to take your cutting and place it into your soil in a sunny place and cover the top with topsoil. Keeping your soil moist will be very important while the onion begins to establish itself. If you’re in the North East like myself you will want to keep the onion indoors in a container during the winter. If you repeat the cycle and keep planting the onion roots eventually you should have enough onion plants going that you’ve become onion self-sufficient! Whenyour growing your own sweet potatoes you want to be sure and use an organic soil as most commercial growers use chemicals to keep them from shooting.When you plant sweet potatoes you want to use the ‘eyes’ just like you do with a regular potato. You can bury the entire potato or pieces like you did with regular potatoes under a thin layer of topsoil in a damp and sunny place. Soon you will have new shoots beginning to appear from the soil. When the shoots begin to reach a height of four inches you will replant your pieces giving them around 12 inches between one another. Generally it take somewhere around 4 months to grow sweet potatoes like this. Keep a watchful eye out for slugs, they will be trying to eat your crop before you can. To get your mushrooms to propagate take off the head and place the stalk into your topsoil, making sure to expose the top to the air. If you have the right conditions for your mushroom you will have a new head grow from your base. You should have some very clear feedback if your mushroom has taken or not very quickly.You want to grow mushrooms in a pot, trying to grow them in your garden would have too much competition from other mushrooms. Growing mushrooms inside of a container also allow you to mow the container around and provide different conditions for the mushrooms, which will help them propagate faster. I’ve experience the greatest success by providing a warm filtered light during the day and cool temperatures at night. 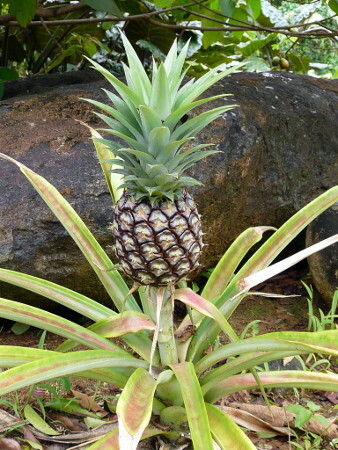 To start growing pineapple you will need to take the leafy green top and remove all the fruit (yellow parts). To harvest a starting piece form a pineapple take a good grip of the leaves and twist the crown off of the fruit. If the brut force tactic isn’t for you can take a good chef’s knife and slice of the top of the pineapple and scrap off the flesh of the fruit with a spoon. Take a sharp knife and begin to slice small horizontal pieces off of the bottom of the crown till you can see root buds (picture left). Peel off a few layers of the leaves from the base of your pineapple cutting. With your prepped pineapple cutting prepare a container of warm water and place it cut side into the container. When the cutting begins to root replant it into a container with soil and be sure to water once a week. This kitchen scrap recycle is a long game, you won’t have a pineapple worth harvesting for 2-3 years. Rather than tossing your avocado seed when you’re getting the fleshy fruit for your cooking use it to grow your own avocado plant. Warning this one is going to take even longer to fruit then the pineapple if ever. House grown avocado plants rarely fruit and if you can grow it outdoors it could be 5 to 13 years before your eating your own avocados. People who farm avocados grown them off grafts (maybe a good idea for another article?!). Take your seed and wash in the sink, with your cleaned seed stick in three or four toothpicks and suspend it above a glass of water. You want to place the seed broad end down and cover the seed with around an inch of water. Place your container into a warm area in an area with filtered sunlight and add water as needed. Within 2 – 6 weeks you will see roots and a stem begin to sprout. Once your avocado has a stem that is 7 inches long cut it back to 3 inches, this will focus the seeds back in to growing a strong root system. When your roots are thick and the stem has re-leafed take out the toothpicks and place the plant into a rich humus soil. I suggest using a 10 inch diameter pot. Leave the seed half exposed when you plant it into the soil. GROWING CARROT-TOPS | FUN FOR THE KIDSNow that your plant is in the soil you want to supply it with a continual supply of light watering with an occasional deep soak. Avocados prefer a soil kept moist but you want to avoid saturating it too much and drowning the roots. If your leaves begin to turn yellow you are watering it too much, give the plant a few days of from watering. Now that the plant is established you want to begin to give it as much sunlight as you can. If you notice that your leaves are beginning to brown at the tips you have a salt build up in your soil and you will need to water the soil thoroughly and let it drain. Once your stem reaches 12 inches in height you will want to cut it back to 6 inches to help new shoots grow. Because carrots are a tap-root you can’t actually regrow the part we all eat. You can how ever grow a fun attractive flowering plant for your kitchen. Growing the carrots is a my son’s favorite from this list. The next time you buy carrots for cooking cut off the tops leaving and inch or so of the vegetable attached. Just like the avocado take several toothpicks and stick them into the side of carrot. Place your carrot cutting into a container with water high enough to reach the bottom of your cutting. Place your container in an area that will receive filtered sunlight and make sure that as the water evaporates or is consumed by the carrot you replace it to keep the bottom of the carrot wet. Within a few days you should see the roots begin to sprout. When you see you roots sprouting you can transplant the plant into a bed of soil. Depending on your conditions your success may vary from mine, God knows I’m not always successful with my attempts. These are great activities for black thumbs because you’re using kitchen scraps rather than spending money on saplings or seeds. Do you have any suggestions of plants we missed, share with us in the comments below! If you need help growing herbs in your kitchen check out these herb growing kits from Amazon. I just bought one of them for my sister as a house warming gift. What a good brother I am.